The story of the Congregation of the Sisters of Mercy of Newfoundland began when Bishop Michael Anthony Fleming traveled to Dublin, Ireland where he approached Catherine McAuley to request a community of Sisters of Mercy for his island mission. To facilitate his plan, the bishop agreed to send to the convent on Baggot Street a young lady to be trained as a Sister of Mercy so that she could return to Newfoundland and found a Convent of Mercy in St. John’s. The bishop’s choice for this important role was Marianne Creedon, a young Irish lady who had lived in St. John’s since 1833 and who was familiar with the needs of the mission. 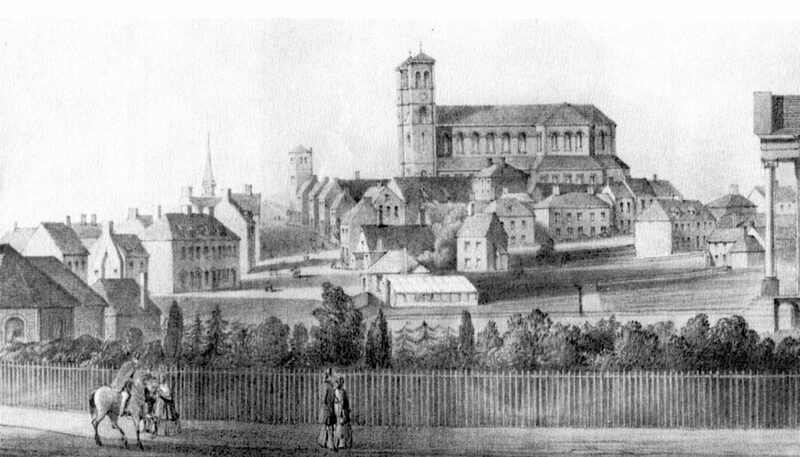 Catherine McAuley received Marianne Creedon into the novitiate at Baggot Street, and on August 19, 1841, Marianne, now Sister Mary Francis, was professed as a Sister of Mercy. Nine months later, on May 2, 1842, Sister Francis Creedon, accompanied by Sisters Ursula Frayne and Rose Lynch left St. Catherine’s Convent, Baggot Street, and crossed the Atlantic Ocean to form the first community of the Sisters of Mercy in the New World. They arrived in St. John’s, Newfoundland on June 3, 1842. This date marks the establishment of the Congregation of the Sisters of Mercy of Newfoundland. During the first eleven months of the new mission, the Sisters of Mercy visited the sick and the poor in their homes. On December 12, 1842, the Sisters moved from their temporary home, the bishop’s residence, to their new convent on Military Road. This was the first Mercy Convent in the New World. On May 1, 1843, Our Lady of Mercy School, Military Road, was formally opened. The convent was located just below the Basilica of St. John the Baptist according to specifications as described by Bishop Fleming. Shortly after the arrival of the Sisters of Mercy in Newfoundland, Maria Nugent, a native of Waterford, Ireland, joined the community. A few months after her arrival in Newfoundland in 1833 Maria had entered the Presentation Convent but withdrew two years later because of illness. While with the Presentation Sisters, Maria had completed all the conditions of a canonical novitiate. Therefore, it was decided that a second novitiate with the Sisters of Mercy was not required and Maria Nugent, now Sister Mary Joseph, was professed as a Sister of Mercy on March 25, 1843. Unless the Seed Dies . . .
On November 18, 1843, Sisters Ursula Frayne and Rose Lynch returned to Ireland, and for the next four years Sisters Francis Creedon and Joseph Nugent divided their time between teaching in the school and visiting the poor and the sick in their homes and in hospital. On June 17, 1847 Sister Joseph Nugent died of typhus contracted during her nursing duties at St. John’s Hospital. Sister Francis was left alone and it is due to her fidelity, dedication and perseverance that the Congregation of the Sisters of Mercy survived and flourished in Newfoundland. In April 1848, Sister Francis welcomed her niece, Agnes Nugent, as a postulant at Mercy Convent. In 1850 Sister Francis had the joy of receiving two more Irish ladies into the community. On July 2, 1855 the first Newfoundlander, Anastasia Tarahan, was received as a novice at Mercy Convent. 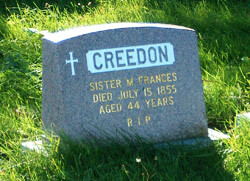 Thirteen days later, on July 15, 1855, the gentle, courageous foundress of the Newfoundland Sisters of Mercy, Sister Francis Creedon, died. She was succeeded by Sister Francis Xavier Bernard who, before her death in 1882, saw forty young women professed as Sisters of Mercy, fifteen of whom were Newfoundlanders.